Net54 moderator Leon Luckey wants out and according to several collectors who have spoken with him, he is trying to unload the collector forum he owns and moderates for lots of cash. According to several sources Luckey wants to sell his forum to Beckett, the privately held company that offers card grading services and operates as a collectibles industry media outlet and publisher. Luckey resides close to Dallas, Texas, and Beckett’s main offices are also located in Dallas. Luckey, 54, has been the focus of hobby drama for the past few months since Hauls of Shame broke the story that he was selling a rare Peck & Snyder trade card that was stolen from the New York Public Library. Despite a recent article published in the New York Daily News, which attempted to portray Luckey as a generous collector who willingly returned the stolen property to the library, several of his Net54 members called him on the carpet for his hypocrisy and alleged shady dealings with Heritage Auctions after it was revealed that he knew the card had been stolen before he entered it in the sale. In response to the onslaught of criticism, Luckey banned member John McDaniel (known as Wonka) and just yesterday banned another member who has been very critical of his dealings, the New York defense attorney and collector Jeffrey Lichtman. Lichtman and McDaniel publicy scolded and exposed Luckey and as one investigator familiar with the NYPL theft case told this writer “they shamed him into returning the stolen card to the NYPL.” Lichtman has also been very critical about Luckey’s long-time support of disgraced auctioneer Bill Mastro who was recently sentenced to a 20-month prison term. Luckey lost out on a six-figure payday when Hauls of Shame publicly exposed his card as stolen property and his members also called him out for falsely portraying the reason for the sale of his collection being to pay for his daughter’s college education. Luckey’s collection sold for close to $1 million (before HA commissions) even after returning the stolen card to the Spalding Collection in New York City. 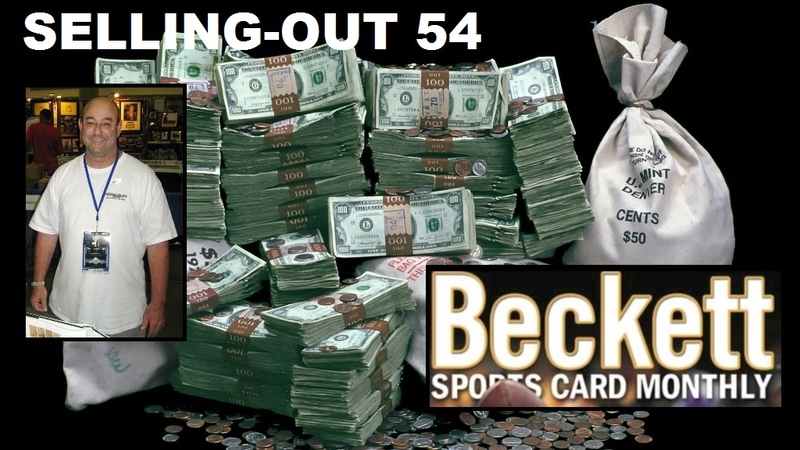 Yesterday morning, a source with inside information contacted us with the exclusive story confirming that Luckey is attempting to sell Net54 to Beckett for a possible $650,000 which would constitute another big payday for the former drug dealer who amassed a sizable baseball card collection in the years after receiving two drug convictions. Our source, a Net54 member in contact with several hobbyists who have spoken directly with Luckey, is disturbed by the potential sale but not surprised that Luckey is attempting to cash out. ”He’s a twice convicted drug dealer who hasn’t worked in years since he was fired from his last job. It’s his last chance to make some real money in his lifetime. He hated moderating the board, he’s tired of people talking about his stolen Peck and Snyder card and his lying about selling his collection solely to fund his daughter’s college education–as opposed to what was stated in the Heritage catalog,” said our source. 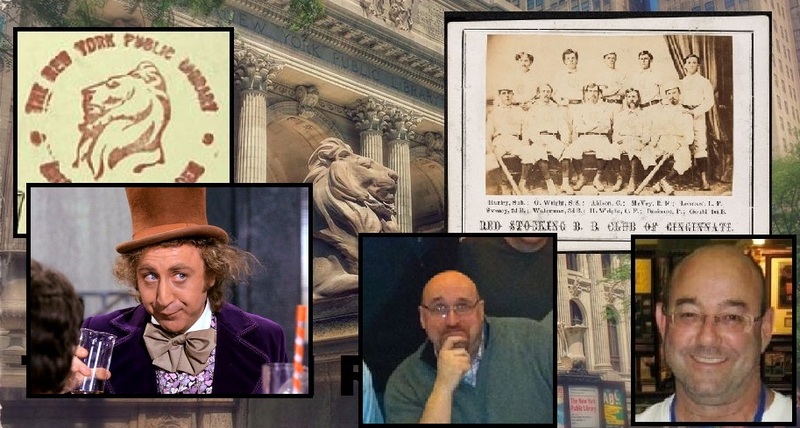 After HOS exposed Leon Luckey's 1869 Reds card as being stolen from the NYPL, Net54 member John McDonald (inset known as "Wonka") further highlighted Luckey's hypocrisy as a self-proclaimed hobby fraud-fighter and was quickly booted off the forum by Luckey. Luckey has posted a slew of false and libelous statements about Hauls of Shame including claims that the comments section is not real, that our sources are non-existent and that this writer has actually set up Net54 accounts under fictitious names that post on his site. In reality, a good portion of our commentors and readers are actually members of Net54 just like our very real source featured in this report. Chris Olds of Beckett Media did not respond to our request to confirm or deny Beckett’s interest in purchasing Net54. A Net54 member saved the post that got John McDaniel banned from the forum before Leon Luckey removed it from his website. I hope Beckett comes to their freaking senses. Doing the “right thing”, or “being honest just doesn’t seem to be in his DNA. Banned from fitty fo fo life, n proud! Wonder what long time forum moderators Elliot Bassin and Bill Cornell have to say about this. LL didn’t create net54 from scratch, in fact, he wasn’t an original member. He took over moderator duties in de facto fashion and then used his privileges to move the site to a private server and profit from it by selling banner ads and later on by pimping his own “auction house”. Shame on you, LL. I found a baseball card in an old tire. I think it might be from the same set as this Netfifty4. The guy in the picture is holding a baseball bat. Can you let this old man know what it’s worth? Chris Olds probably did not respond because he no longer works for Beckett. How many other simple, basic facts did you get wrong in this story? Thanks for the correction regarding Olds. How many of these lowlifes are there? They just keep coming out of the woodwork. I certainly hope that the NYPL has decided to implement a security program. Did they ever think to have someone monitor every person one-on-one who asks to access a priceless collection? Which fact about Luckey is wrong? That he’s a twice convicted drug dealer? No, that’s correct. That he has been in talks to sell Net 54? No, that’s correct too. Has he specifically denied that? No. I just pooped, I’m OK now. Money talks and Leon walks! So many crooks and Mastronauts. Cashing out for upcoming legal fees. Maybe the coach in the corner should move to Costa Rica and some NYPL card holders soon. Not sure what’s funnier, Leon still not denying he was in talks to sell Net 54 or gary Chen not noticing how many serious collectors no longer post on Net 54 or have been banned. Lots of small collectors left who won’t challenge all of Leon’s obvious lies. Still waiting for Leon to deny that he was in talks to sell Net 54. He told anyone who would listen. Leon Luckey gets the GAS FACE! 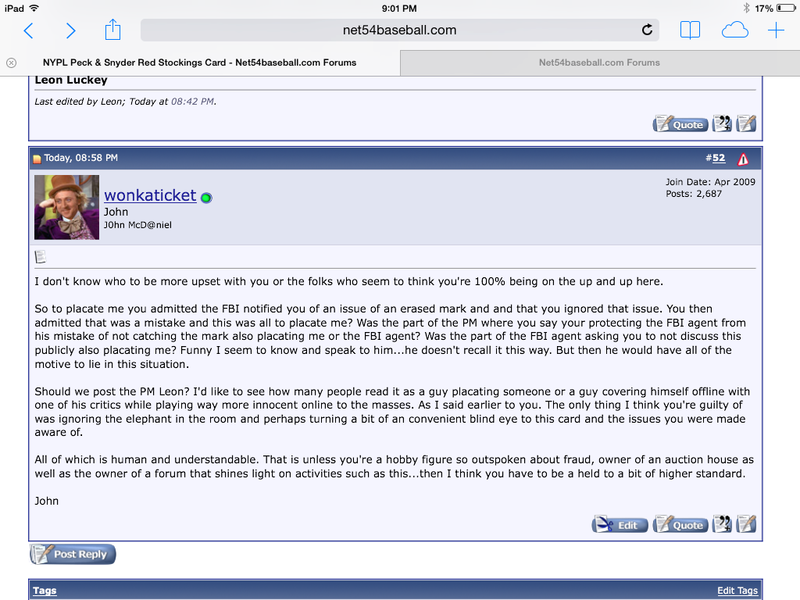 I can’t imagine why Beckett would pay that kind of money for an online forum. After all, they already have their own and there does not appear to be anything special they would gain by doing so. Companies buy things when it will likely make them money. Sometimes they do stupid things and overpay because of hype, but I had not actually even heard of these people before reading this posting. About the only reason to purchase something like this is if it would increase awareness of their site, and who is unaware of Beckett? Very interesting to know the kind of people who are big players in this hobby – bouncing from one kind of crime right to another. I’m not even a big collector myself, I’m mostly just interested in the continuing exposure of theft from public institutions. I echo the above commentator in asking why on earth Beckett would want to pay so much for an online forum.